How to set up Virtual Server/ Port Forwarding on ASUS Wireless Router? 1. Router WAN IP address – This is the IP address provided by your ISP to access the Internet. This WAN IP address will also be used to access the PC providing the service. In this example, the Router WAN IP address is “123.123.123.123”. 2. 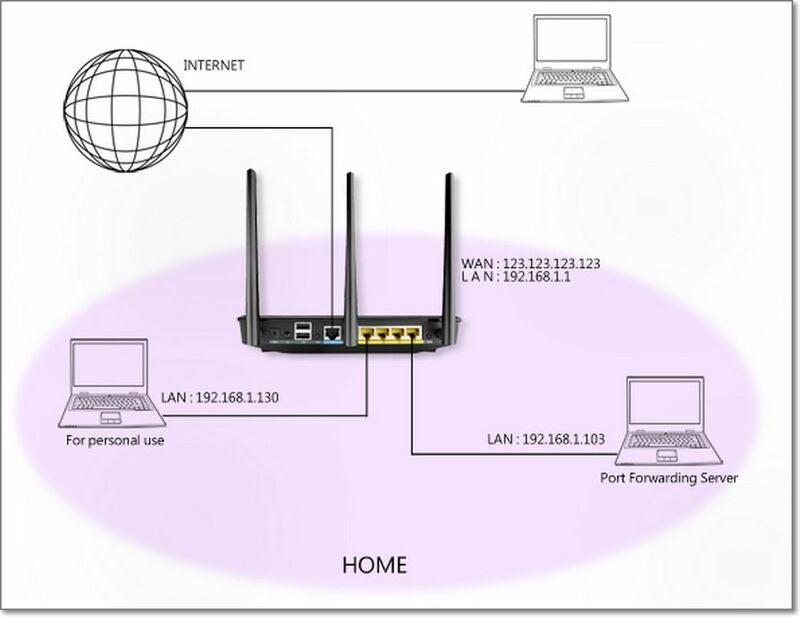 Router LAN IP address – The default IP address of your ASUS router is “192.168.1.1”. 3. For personal use – This computer has been assigned a LAN IP address of “192.168.1.130” by the router. This PC does not provide any network service. 4. Server LAN IP address – This PC is assigned a static LAN IP Address of “192.168.1.103”. This is the server PC that provides network services to other clients on the Internet. Port forwarding will be applied to this PC. Launch a browser and access router settings by keying in LAN IP address or http://router.asus.com on the address bar. Click “WAN” on the Advanced Settings menu on the left panel. Click the “Virtual Server/Port Forwarding” tab. Before setting up port forwarding for a FTP server, a PC on the Internet cannot connect to the FTP server. Under the Basic Config section, select “FTP” from the “Famous Server List” item. 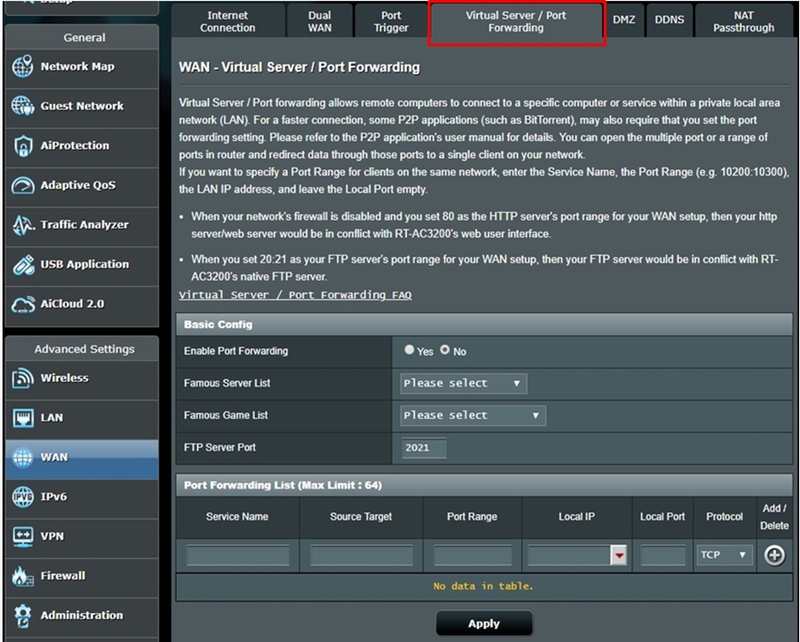 Input a port or port range for the FTP server and select the Local IP. In this example, the Server LAN IP address is “192.168.1.103“. Click on “Edit” and then click on “Apply“. Note: Do not use the port range 20:21 for an FTP server if the AiDisk service on the router has been enabled. (a) Leave it empty. Unspecified, that is, any source IP can. Ensure that your FTP server is set up and running. You will need a PC outside your LAN but has Internet access (hereafter referred to as “Internet PC”). This PC should not be connected to the ASUS router in any way. On the Internet PC, use the router’s WAN IP to access the FTP server using a FTP application or FTP browser. If port forwarding has been successful, you should be able to access the files on the FTP server. Before setting up port forwarding for an HTTP server, a PC on the Internet cannot connect to your server/PC via HTTP. Under the Basic Config section, select “HTTP” from the “Famous Server List” item. 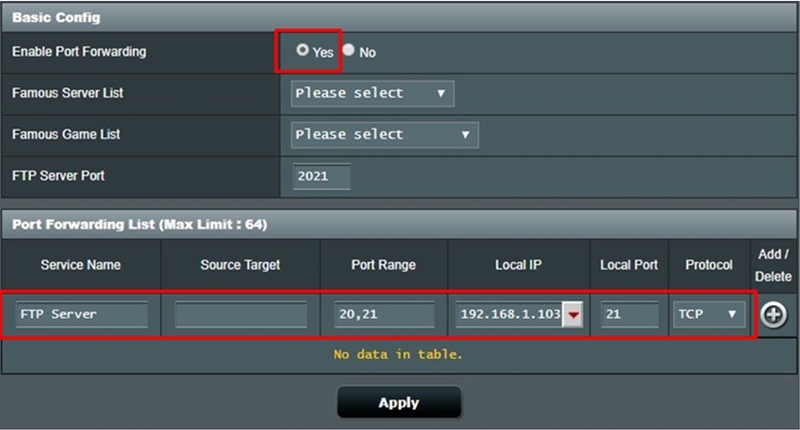 Input a port or port range for the HTTP server and select the Local IP. Ensure that your HTTP server is set up and running. On the Internet PC, launch a web browser and key in the router’s WAN IP address on the address bar. If port forwarding has been successful, you should be able to access the web page provided by the HTTP server. **If you want to forward a port range, for example 10200:10300, to a PC which is using the same port range, enter the service name, port range, and local IP address, but leave the local port blank. How to set up Virtual Server and Port Forwarding on ASUS Wireless Router? How to configure INBOUND FILTERS on my DIR Series Router such as D-Link DIR-868L? 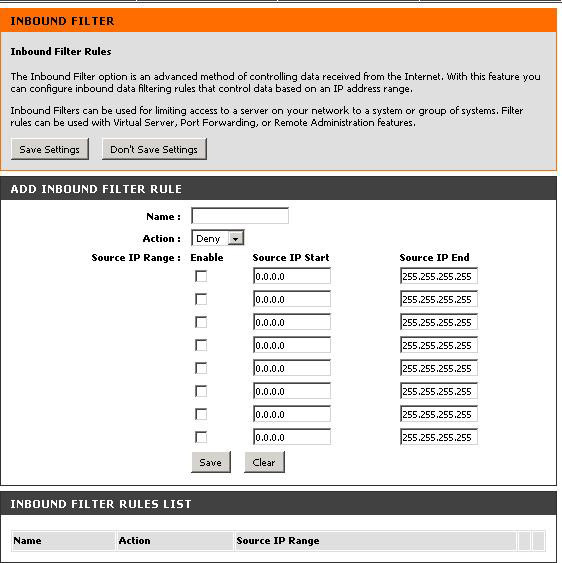 Inbound Filters can be used for limiting access to a server on your network to a system or group of systems. Filter rules can be used with Virtual Server, Gaming, or Remote Administration features. Each filter can be used for several functions; for example a “Game Clan” filter might allow all of the members of a particular gaming group to play several different games for which gaming entries have been created. At the same time an “Admin” filter might only allows systems from your office network to access the WAN admin pages and an FTP server you use at home. If you add an IP address to a filter, the change is effected in all of the places where the filter is used. Here you can add entries to the Inbound Filter Rules List below, or edit existing entries. Enter a name for the rule that is meaningful to you. The rule can either Allow or Deny messages. Define the ranges of Internet addresses this rule applies to. For a single IP address, enter the same address in both the Start and End boxes. Up to eight ranges can be entered. The Enable checkbox allows you to turn on or off specific entries in the list of ranges. Saves the new or edited Inbound Filter Rule in the following list. When finished updating the Inbound Filter Rules List, you must still click the Save Settings button at the top of the page to make the changes effective and permanent. The section lists the current Inbound Filter Rules. An Inbound Filter Rule can be changed by clicking the Edit icon, or deleted by clicking the Delete icon. When you click the Edit icon, the item is highlighted, and the “Edit Inbound Filter Rule” section is activated for editing. Permit any WAN user to access the related capability. How to open Virtual Server Ports to Enable Remote Image Viewing Using D-Link DI-624 and DCS-2120? 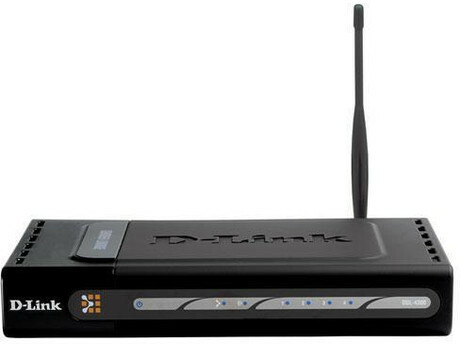 The firewall security features built into the D-Link DI-624 router prevent users from accessing the video from the D-Link DCS-2120 over the Internet. The router connects to the Internet over a series of numbered ports. 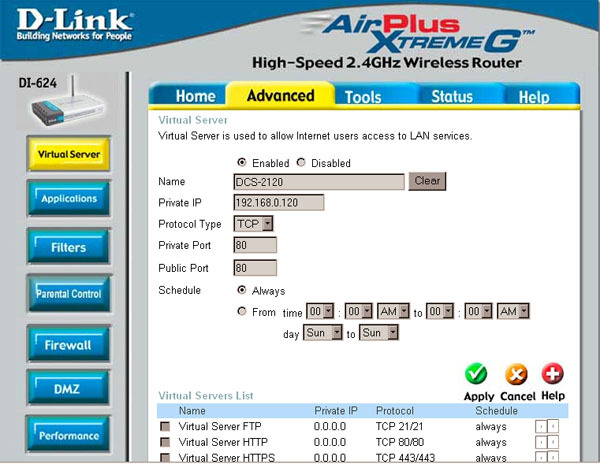 The ports normally used by the D-Link DCS-2120 are blocked from access over the Internet. Therefore, these ports need to be made accessible over the Internet. This is accomplished using the Virtual Server function on the DI-624 router. 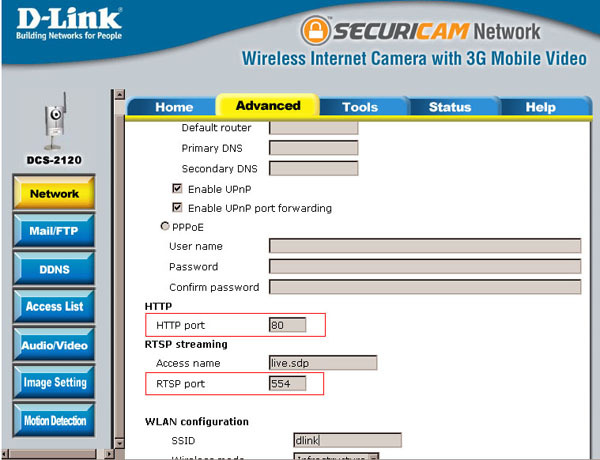 The Virtual Server ports used by the camera must be opened through the router for remote access to your camera. Virtual Server is accessed by clicking on the Advanced tab of the router screen. **In this example, we are using the DI-624. The Virtual Server interface may differ depending on your router*. Step 1: Open a web browser such as Internet Explorer and enter the IP address of your router (192.168.0.1). Enter username (admin) and your password (leave blank). Step 2: Click on the Advanced tab and then the Virtual Server button on the left. Step 4: Enter a different name for each entry. Step 5: Enter your camera’s local IP Address Private IP field. Step 6: Select TCP for HTTP port and both (TCP and UDP) for RTSP port. Step 7: If you are using the default camera port settings, enter 80 into the Public and Private Port section, click Apply. Step 8: Scheduling should be set to Always so that the camera images can be accessed at any time. Repeat the above steps adding the port 554 to both the Public and Private Port sections. A check mark appearing before the entry name will indicate that the ports are enabled. Important: Some ISPs block access to port 80 and other commonly used Internet ports to conserve bandwidth. Check with your ISP so that you can open the appropriate ports accordingly. If your ISP does not pass traffic on port 80, you will need to change the port the camera uses from 80 to something else, such as 800. Not all routers are the same, so refer to your user manual for specific instructions on how to open ports. Enter valid ports in the Virtual Server section of your router. Please make sure to check the box next to the D-Link camera name on the Virtual Server List to enable your settings.